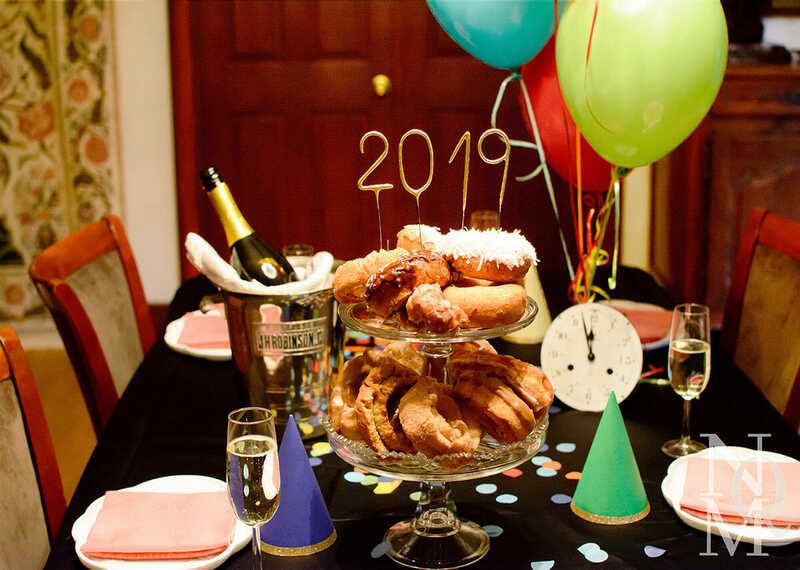 One of the best small group NYE parties that we’ve had to date is super easy to execute—and it works well with or without kids! I know it may sound a little dorky to play games at a New Year’s Eve party but it’s actually super fun! If you want to have more time for mingling, consider waiting to start games until 8 or 9 pm so that there are a number of hours of mingling and noshing. Or have the kids play games for the first few hours while the adults mingle and then set up a movie for the kids at which point the adults shift into game mode. One year we requested pajama attire which helps get the little ones into bed more easily, yet you can skip this for grown-ups if you’d like in lieu of more festive attire. The same year we had toddlers attending so we started at 4:30 pm and put the youngest kids to bed well before midnight. Other years haven’t started until 6 pm, served cocktails and dinner and then began playing games at 8 pm. So, you’re probably thinking, how does the game system work to make it a better party? And how do you pull this off? You pair a balloon with a game and inside the balloon is the game’s title. As guests arrive, they choose which game or activity they’d like to play then set it and then follow the step by steps below for a fun filled evening! After your guests pick their preferred game, you gather the corresponding balloon and group it with the other chosen balloons, then at the top of every hour a guest picks one and pops it. Next, everyone plays the game that was noted inside the balloon. It’s great because most everyone gets to play their favorite and, even if it’s not your fav, you’ll only be playing it for a short time. Something about New Years and how people trickle in to a party, pushes me to do a buffet every time. I set out all the food at the party’s start, pared down to snacks around 8 pm +/- and at midnight a breakfast casserole is served to counter balance any cocktails and send people home with a full tummy. Keep it simple yet hearty to balance the cold weather: things like pulled pork sandwiches which I make in the slow cooker and shortcut by buying BBQ sauce and using pre-cut slaw mix and adding bacon plus nicer blue cheese dressing, a baked potato bar, soups or chili with a variety of breads. Sausage and croissant casserole – this is a family favorite! Biscuits and gravy, or biscuits with cheddar, ham and mustard using bakery made or Pillsbury ready to bake biscuits. Fried chicken and waffles are a super popular combo these days – get take out chicken to lighten your workload. Waffle or pancake bars are another pretty easy, make ahead options and are a nice way to include fruit in the menu; or copy my friend who pre-makes the batter and stores it in a lidded pitcher, heats up her waffle iron and has her guests make their own waffles. Tex-mex breakfast casserole is another fav of mine and it allows for easy side dish options like chips, salsa, guacamole, refried beans, Spanish rice and more. using the ‘What to Bring’ app on Evite where you list out quantities and requests for folks to choose from. ask guests to add whether they want to bring ‘sweet’ or ‘savory’ on an online invite. individually ask people to bring fairly specific things (like a quiche, green salad, etc.). Drink wise, the obvious option is champagne and champagne cocktails like The Parasol or a French 75 although it feels like many folks don’t love champagne in the same way I do, so it’s good to offer another signature cocktail option as well as wine and beer. Non-alcoholic offerings can be a juice bar, something simple like lemonade. If you’re up for the extra work and want to elevate your offerings, try something extra fancy like Italian Sodas or Shirley Temples which kids go nuts for. Desserts can be anything but I’d recommend keeping it easy and kid friendly: donuts, brownies or cookies. Cake and pie work well too but you’ll need to provide forks and plates so I often find finger foods only best. It feels more festive if you opt for helium balloons. In order to keep the surprise element and added fun going, it’s crucial that you only use 1 or 2 colors of balloons. If you don’t have time to go buy helium balloons, just use good ‘ole lung power and blow them up. Each balloon has a folded-up piece of paper inside it such that the name of the game is kept secret thus only use all identical colored and sized paper and fold them the same way. Pre-write the game names and insert the folded game slip into the balloon before filling it—if getting helium balloons, be sure to bring the game slips to the store. Mark the balloons securely but temporarily until you get home and pair them up with the correct game. Use ribbon or string to tie a bow (not a knot—as they need to be removable) on the correct balloon on the its matching game; I like to vary the length of the ribbon for a prettier display. Arrange the games and the corresponding balloon on a table; be sure to offer a few more than the number of guests and also display a variety of games: luck and strategy, easy and challenging. As guests arrive, ask them to choose their favorite and set the game/balloon in a separate spot, which leaves a pool of possible games for other guests to choose from; it helps to have simple instructions framed or taped on the wall. Also, have guests write their name on a small piece of paper and place it in a jar. Once all guests have selected the games, detach the balloons from the games, mix them up and display the balloons. Mix up the jar of guest names and once dinner is finished, draw a name randomly from the jar and then that person then chooses a balloon and pops it or gets a brave kid to pop it for them. A person familiar with the game gives quick instructions before beginning and everyone plays! Be sure to set 1 hour on a timer! Trust me when I tell you that people get super absorbed in certain games and you’ll run past your cut-off time otherwise. Find a way to denote which games are suitable for younger kids if little ones are participating. Be sure to choose these early on so that they can turn in early if needed or be shifted to movie time. Remember to stop a few minutes before midnight to refill everyone’s glass! Hopefully this party plan helps you enjoy New Year’s with your friends and family in a new way!